StalkMarket AseanDisposable Plates STMP011R $46.39 Disposable plates are a natural alternative to Styrofoam and plastics. 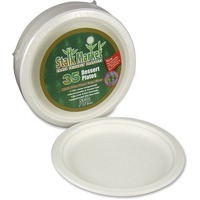 Made from sugarcane fiber, these oil resistant plates are microwavable and freezer safe. Cut resistant design is highly durable and can be used for hot and cold meals.